Hello! Here's a recipe idea I've been meaning to share for a while. It's a tummy filling, comfort blanket of a dish that I've been making since I was a student years ago. It's similar to other pasta bakes but the bread is torn into chunky pieces, not made into fine crumbs, and is layered through the dish instead of being reserved for the topping. This creates super gooey tomato soaked bread pieces as well as some crunchy toasty morsels around the sides and top of the dish. The bread bulks out the pasta making this a very economical meal. I always make too much and we always manage to eat the lot. In fact the last mouthfuls at the bottom of the dish are the tastiest. Boil the pasta until slightly softened and then drain. Meanwhile make a simple tomato sauce using chopped onions and a tin of chopped tomatoes and any other veg you have available. Season to taste and add herbs, tomato purée, a splash of Worcestershire sauce and balsamic vinegar to taste. 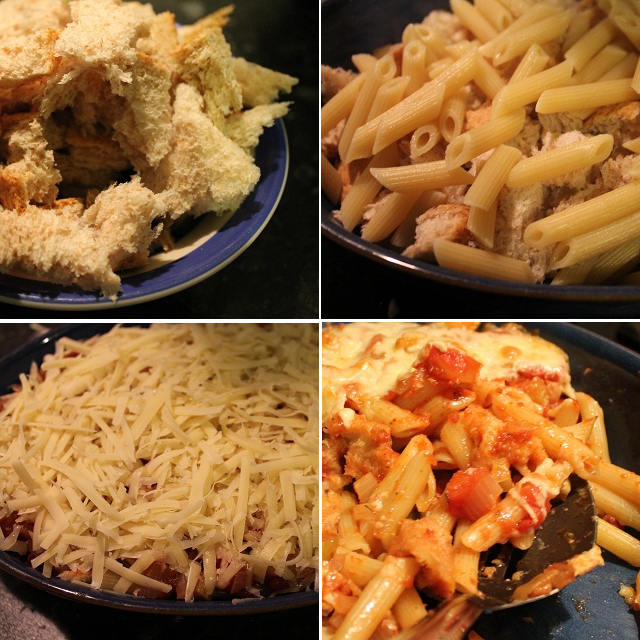 Layer the broken bread pieces into the cooking dish alongside the part cooked penne. Cover the bread and penne with the tomato sauce, top generously with grated cheese and bake uncovered at no higher than 200 degrees C for about 30 minutes. By then the cheese should be golden brown. Pile high and serve simply with a salad or a portion of sweetcorn or peas. Mmm, looks delicious. I really like using bread in dishes, especially with tomato - it always seems to go together so well. I like the sound of that, I will give that a try with winter coming up. This not only looks yummy but it sounds divine too. I have book marked this to make soon, very soon. Will have to try this, looks absolutely yummy! What a good recipe to stretch the food budget.